This island lying between Hawaii and Australia was initially discovered by the US whaler Captain George B. Worth, who originally named it after himself as Worth Island, in 1822. 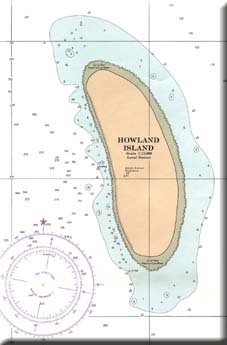 The name was changed in 1842 to Howland Island by Captain George E. Netcher of New Bedford, who visited Howland in the whale ship Isabella in 1842. It may have been named after the lookout who spotted it first. It was annexed by the Americans in 1857 by the American Guano Company. They intermittently mined it for guano but usually only over short periods of time. This was a period of some competition and tension between Britain and America at the time. But the fact that it was generally uninhabited made that ownership was difficult to enforce. Consequently the British claimed it for themselves in 1886 and from 1885 to 1891 a British company with 100 employees mined the island for guano. The development of long distance seaplanes in the 1930s drew American attention back to the Pacific in the 1930s and they reclaimed and actually colonised the island from 1935. Howland Island actually hit the world headlines for a brief period in 1937 when it was supposed to be a staging post for Amelia Earhart as she attempted to fly around the world. She went missing on this leg of the journey and so never arrived at this her intended target. A beacon has since been placed on the island named in honour of her. 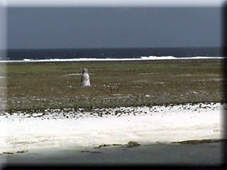 It is the only landmark of note on the island. World War Two would demonstrate the value of these islands as staging points and reconnaisance bases for aircraft - especially as the Japanese drew closer to this corner of the Pacific in 1942/3. The US built a Naval Airbase on the island as a consequence but this was abandoned after the war.